I’m not usually the long-winded blogger, but I've been carefully putting this post together for a few months and I’ve begun to wonder if this may be a book in the works for me. 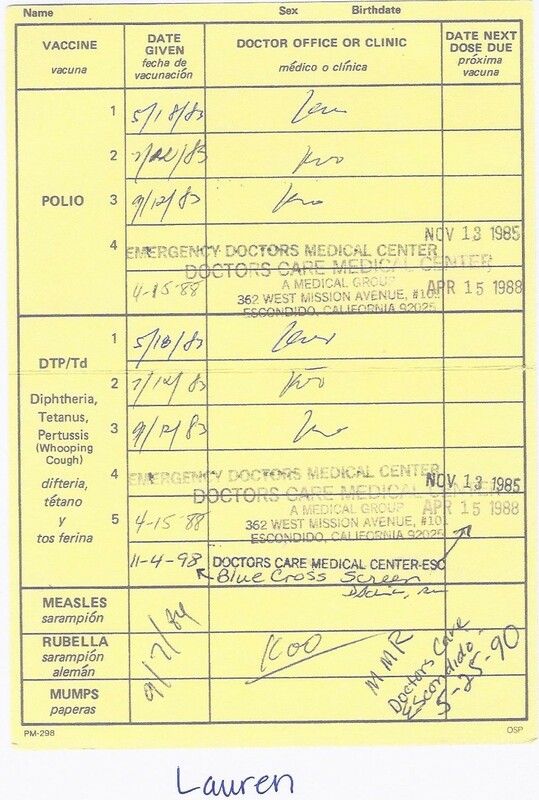 I’ve gathered some of my own personal records to share why I have chosen to discontinue vaccinating my children. I wish that I would have known sooner what I know now but I’m thankful that I’ve been able to slowly educate myself so that I can feel confident with my choice and that I’m doing the best thing for my kids. As parents, and as with everything that we do with our children, it is our right and our responsibility to make educated choices that we feel are in their best interest. The thing is, in this case, the drug companies and most doctors would rather we stay blissfully ignorant. Because when we make the choice to decline vaccinations, or to not take their drugs, they’re all losing money. And if the word keeps spreading, they’ll keep losing money. Have you ever paid attention to the plethora of ads out there promoting prescription drugs for just about everything you can possibly think of? Have you ever listened to the really fast chatter at the end of the commercials, or the REALLY fine print at the bottom of the pages, that lists the even longer list of risks and side effects? Oh but don’t worry, there’s also a prescription for the side effects. There’s a drug for nearly every illness out there, and they’re working on a drug to prevent everything they possibly can. Our natural immunity hardly stands a chance anymore. Could this all be just one more ingredient in the rise in sickness and disease in America? To me, being so highly interested in health, it’s kind of hard to ignore and it is just sickening. Literally. Anyway, I could go on and on and on. This is a topic that I have done plenty of my own research on and I feel it is important for me to pass it along. One of the problems, in my opinion, is that parents are scared into thinking that they HAVE to give their children shots or they’re putting them at risk. Many parents argue that “we’ve all had them and we came out ok.” Most of the statements I see/hear parents make are ignorant statements. They aren’t educated statements. They are made out of fear. Because to make the decision to not vaccinate your children, you WILL be going AGAINST the grain. You WILL have to stand up and defend yourself in the pediatrics office, in the nurse’s office at school, and to your own family members (if you choose to discuss it). The choice is much like religion or politics. You have to do what you believe to be the right thing no matter what anyone else thinks or says. 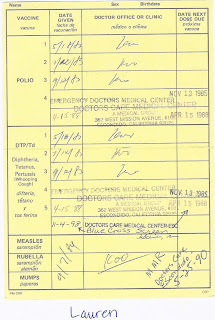 My whole reason for this post is to share with you the progression of vaccinations. 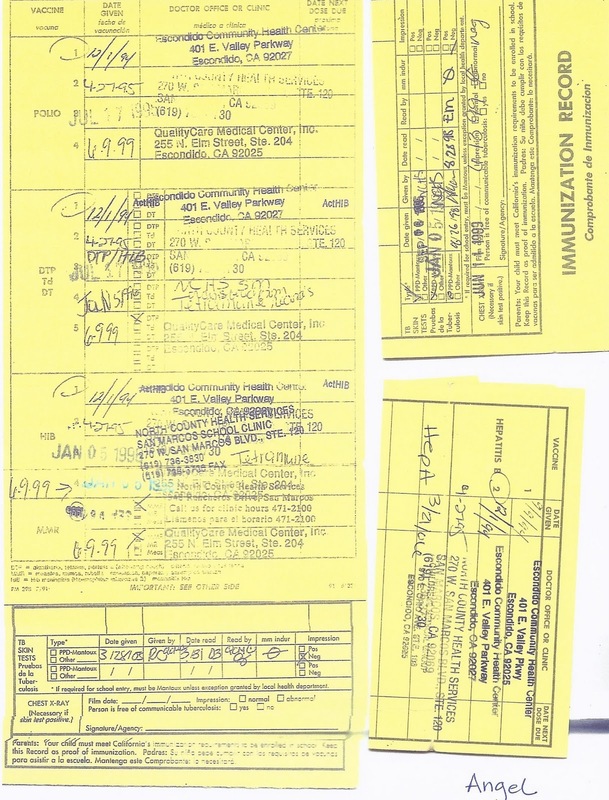 I’ve gathered three actual immunization records from my mom, my sister and one of my own children. These were scanned in and not modified one bit. The supposed requirements have more than quadrupled since our parents were babies. It’s hard for me to not see something wrong with this picture. 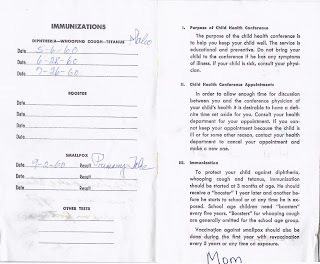 This is my mother’s immunization record from 1960 (born in 1959). 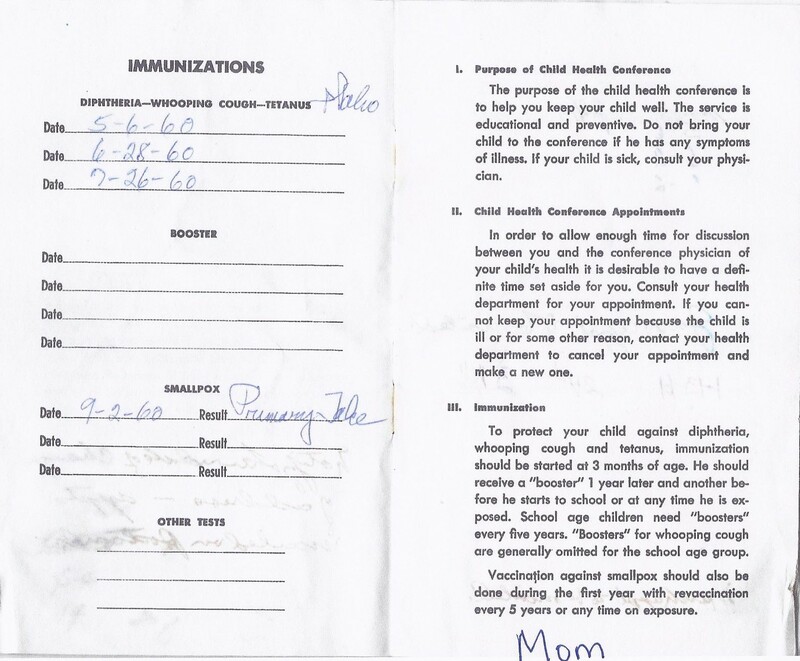 This is my sister’s immunization record from 1983 - 1990. 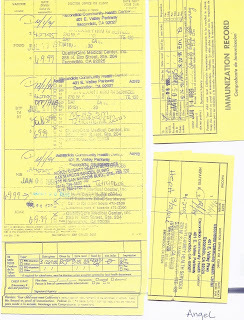 This is my 17 year old daughter’s immunization record (from 1994 - 2006). We stopped vaccinating all of our children in 2007. My 10 year old son had the same amount of shots shown in the above card in half the number of years. At what point is it just too much?? ?